The word "crown" is derived from the Latin “corona” meaning wreath. Originating in Asia and adopted in Europe, the crown has been used as a symbol of power and majesty for several thousand years. The Norwegian King’s Crown was made by the goldsmith Olof Wihlborg of Sweden. King Carl Johan commissioned and paid for the crown to be used in his own coronation in 1818. The crown has been used in the coronation of four kings and has played a prominent role in two consecration ceremonies. Upon the death of a monarch, the crown is place on the casket during the funeral service. The King’s Crown consists of eight hoops rising up from the crown ring and joining in the middle under an orb of blue enamel with gold stars and a band of pearls. At the top rests a cross of six amethysts. Four of the hoops are flat and shaped like oak leaves. The four other hoops are filigreed and shaped like bay leaves. In the middle of the crown ring is a large, green tourmaline, said to be a gift to the King from the Brazilian consul in Stockholm. The cap of purple velvet is decorated with small crowns and 50 pearls. 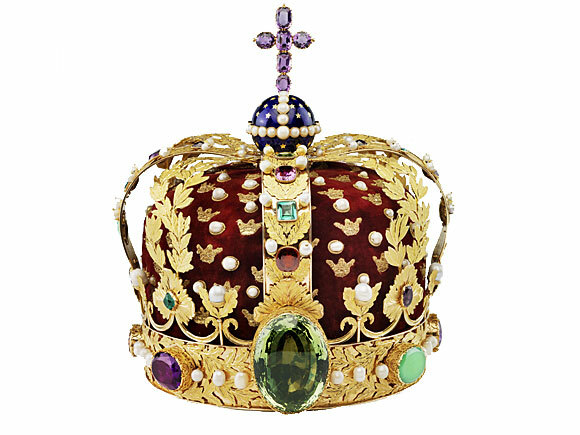 The crown is made of 20-carat gold, pearls and assorted gemstones such as amethysts, opals, peridots, chrysophrases, topazes, tourmalines, sapphires and emeralds.